With inlay of mother-of-pearl like this, the box must be for a bride in the palace to store her valuable personal belongings. It was found after the Japanese Occupation on Kangwha Island, a political prison colony for the Kingdom of Korea for two thousand years. The nacre used in a palace furniture would most likely be from abalone and not from the common oysters. It is meticulously inlaid in a directional-compass design within a hexagon, and the design covers all sides of the box except the bottom. 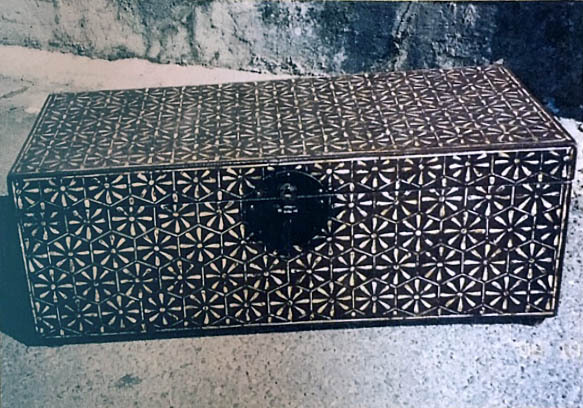 The lock-plate is a simple black iron plate complimenting the intricately inlaid hexagon designs. It survived in excellent condition and was certified as rare by a Professor of Korean History and Antiquity, one of only thirteen certifiers approved by the Korean government in the 1900s.